For centuries humankind has relied upon various plants and animals to provide the raw materials for fabrics and clothing. Silkworms, sheep, beaver, buffalo deer, and even palm leaves are just some of the natural resources that have been used to meet these needs. However, in the last century scientists have turned to chemistry and technology to create and enhance many of the fabrics we now take for granted. There are two main categories of man-made fibers: those that are made from natural products (cellulosic fibers) and those that are synthesized solely from chemical compounds (noncellulosic polymer fibers). Rayon is a natural-based material that is made from the cellulose of wood pulp or cotton. This natural base gives it many of the characteristics—low cost, diversity, and comfort—that have led to its popularity and success. Today, rayon is considered to be one of the most versatile and economical man-made fibers available. It has been called "the laboratory's first gift to the loom." In the 1860s the French silk industry was being threatened by a disease affecting the silkworm. Louis Pasteur and Count Hilaire de Chardonnet were studying this problem with the hope of saving this vital industry. During this crisis, Chardonnet became interested in finding a way to produce artificial silk. In 1885 he patented the first successful process to make a useable fiber from cellulose. Even though other scientists have subsequently developed more cost-effective ways of making artificial silk, Chardonnet is still considered to be the father of rayon. For the next forty years this material was called artificial or imitation silk. By 1925 it had developed into an industry unto itself and was given the name rayon by the Federal Trade Commission (FTC). The term rayon at this time included any man-made fiber made from cellulose. In 1952, however, the FTC divided rayons into two categories: those fibers consisting of pure cellulose (rayon) and those consisting of a cellulose compound (acetate). By the 1950s, most of the rayon produced was being used in industrial and home furnishing products rather than in apparel, because regular rayon (also called viscose rayon) fibers were too weak compared to other fibers to be used in apparel. Then, in 1955, manufacturers began to produce a new type of rayon—high-wet-modulus (HWM) rayon—which was somewhat stronger and which could be used successfully in sheets, towels, and apparel. The advent of HWM rayon (also called modified rayon) is considered the most important development in rayon production since its invention in the 1880s. Today rayon is one of the most widely used fabrics in our society. It is made in countries around the world. It can be blended with natural or man-made fabrics, treated with enhancements, and even engineered to perform a variety of functions. To make rayon, sheets of purified cellulose are steeped in caustic soda, dried, shredded into crumbs, and then aged in metal containers for 2 to 3 days. The temperature and humidity in the metal containers are carefully controlled. After ageing, the crumbs are combined and churned with liquid carbon disulfide, which turns the mix into orange-colored crumbs known as sodium cellulose xanthate. The cellulose xanthate is bathed in caustic soda, resulting in a viscose solution that looks and feels much like honey. cotton linters. Cotton linters are residue fibers which cling to cotton seed after the ginning process. Strictly defined, rayon is a manufactured fiber composed of regenerated cellulose. The legal definition also includes manufactured fibers in which substitutes have not replaced more than 15 percent of the hydrogens. While the basic manufacturing process for all rayon is similar, this fabric can be engineered to perform a wide range of functions. Various factors in the manufacturing process can be altered to produce an array of designs. Differences in the raw material, the processing chemicals, fiber diameter, post treatments and blend ratios can be manipulated to produce a fiber that is customized for a specific application. Regular or viscose rayon is the most prevalent, versatile and successful type of rayon. It can be blended with man-made or natural fibers and made into fabrics of varying weight and texture. It is also highly absorbent, economical and comfortable to wear. Regular viscose rayon does have some disadvantages. It's not as strong as many of the newer fabrics, nor is it as strong as natural cotton or flax. This inherent weakness is exacerbated when it becomes wet or overexposed to light. Also, regular rayon has a tendency to shrink when washed. Mildew, acid and high temperatures such as ironing can also result in damage. Fortunately, these disadvantages can be countered by chemical treatments and the blending of rayon with other fibers of offsetting characteristics. High-wet-modulus rayon is a stronger fiber than regular rayon, and in fact is more similar in performance to cotton than to regular rayon. It has better elastic recovery than regular rayon, and fabrics containing it are easier to care for—they can be machine-washed, whereas fabrics containing regular rayon generally have to be dry-cleaned. While there are many variations in the manufacturing process that exploit the versatility of the fiber, the following is a description of the procedure that is used in making regular or viscose rayon. Regardless of whether wood pulp or cotton linters are used, the basic raw material for making rayon must be processed in order to extract and purify the cellulose. The resulting sheets of white, purified cellulose are then treated to form regenerated cellulose filaments. In turn, these filaments are spun into yarns and eventually made into the desired fabric. 1 Sheets of purified cellulose are steeped in sodium hydroxide (caustic soda), which produces sheets of alkali cellulose. These sheets are dried, shredded into crumbs, and then aged in metal containers for 2 to 3 days. The temperature and humidity in the metal containers are carefully controlled. 2 After ageing, the crumbs are combined and churned with liquid carbon disulfide, which turns the mix into orange-colored crumbs known as sodium cellulose xanthate. The cellulose xanthate is bathed in caustic soda, resulting in a viscose solution that looks and feels much like honey. Any dyes or delusterants in the design are then added. The syrupy solution is filtered for impurities and stored in vats to age, this time between 4 and 5 days. 3 The viscose solution is next turned into strings of fibers. This is done by forcing the liquid through a spinneret, which works like a shower-head, into an acid bath. If staple fiber is to be produced, a large spinneret with large holes is used. If filament fiber is being produced, then a spinneret with smaller holes is used. In the acid bath, the acid coagulates and solidifies the filaments, now known as regenerated cellulose filaments. 4 After being bathed in acid, the filaments are ready to be spun into yarn. Depending on the type of yarn desired, several spinning methods can be used, including Pot Spinning, Spool Spinning, and Continuous Spinning. In Pot Spinning, the filaments are first stretched under controlled tension onto a series of offsetting rollers called godet wheels. This stretching reduces the diameter of the filaments and makes them more uniform in size, and it also gives the filaments more strength. The filaments are then put into a rapidly spinning cylinder called a Topham Box, resulting in a cake-like strings that stick to the sides of the Topham Box. The strings are then washed, bleached, rinsed, dried, and wound on cones or spools. Spool Spinning is very similar to Pot Spinning. The filaments are passed through rollers and wound on spools, where they are washed, bleached, rinsed, dried, and wound again on spools or cones. 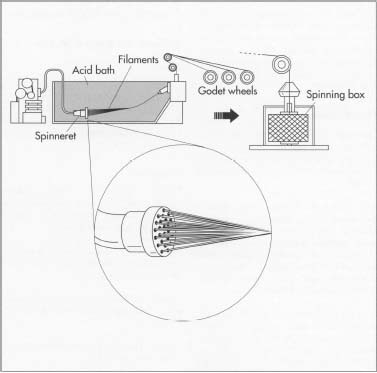 In Continuous Spinning, the filaments are washed, bleached, dried, twisted, and wound at the same time that they are stretched over godet wheels. 5 Once the fibers are sufficiently cured, they are ready for post-treatment chemicals and the various weaving processes necessary to produce the fabric. The resulting fabric can then be given any of a number of finishing treatments. These include calendaring, to control smoothness; fire resistance; pre-shrinking; water resistance; and wrinkle resistance. After the syrupy viscose solution is prepared, it is forced through a spinneret into an acid bath. The resulting strings or filaments are then stretched on godet wheels to strengthen them and put into a spinning Topham box. This method produces cake-like strings of rayon, which are washed, rinsed, and dried before being wound on spools or cones. a weaker caustic soda is used when making HWM rayon. 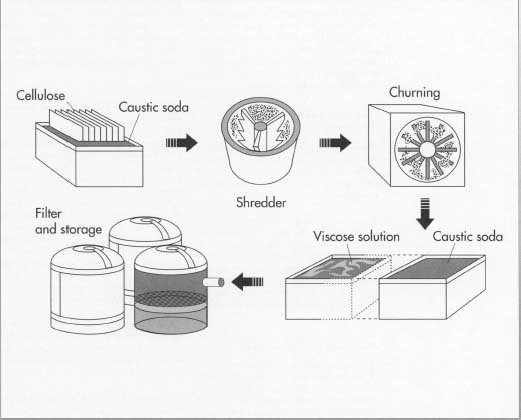 Second, neither the alkali crumbs (#1 above) nor the viscose solution (step #2) is aged in the HWM process. Third, when making HWM rayon, the filaments are stretched to a greater degree than when making regular rayon. As with most chemically oriented processes, quality control is crucial to the successful manufacture of rayon. Chemical make-up, timing and temperature are essential factors that must be monitored and controlled in order to produce the desired result. The percentages of the various fibers used in a blended fabric must be controlled to stay within in the legal bounds of the Textile Fiber Identification Act. This act legally defines seventeen groups of man-made fibers. Six of these seventeen groups are made from natural material. They include rayon, acetate, glass fiber, metallics, rubber, and azion. The remaining eleven fabrics are synthesized solely from chemical compounds. They are nylon, polyester, acrylic, modacrylic, olefin, spandex, anidex, saran, vinal, vinyon, and nytril. Within each generic group there are brand names for fibers which are produced by different manufacturers. Private companies often seek patents on unique features and, as could be expected, attempt to maintain legal control over their competition. As one of the industry's major problems, the chemical by-products of rayon have received much attention in these environmentally conscious times. The most popular method of production, the viscose method, generates undesirable water and air emissions. Of particular concern is the emission of zinc and hydrogen sulfide. At present, producers are trying a number of techniques to reduce pollution. Some of the techniques being used are the recovery of zinc by ion-exchange, crystallization, and the use of a more purified cellulose. Also, the use of absorption and chemical scrubbing is proving to be helpful in reducing undesirable emissions of gas. The future of rayon is bright. Not only is there a growing demand for rayon worldwide, but there are many new technologies that promise to make rayon even better and cheaper. For a while in the 1970s there was a trend in the clothing industry toward purely synthetic materials like polyester. However, since purely synthetic material does not "breath" like natural material, these products were not well received by the consumer. Today there is a strong trend toward blended fabrics. Blends offer the best of both worlds. With the present body of knowledge about the structure and chemical reactivity of cellulose, some scientist believe it may soon be possible to produce the cellulose molecule directly from sunlight, water and carbon dioxide. If this technique proves to be cost effective, such hydroponic factories could represent a giant step forward in the quest to provide the raw materials necessary to meet the world wide demand for man-made fabric. Hollen, Norma, Jane Saddler, Anna Langford, and Sara Kadolph. Textiles, 6th ed. Macmillan, 1988. Foley, Theresa M. "Rayon Fiber Manufacturer Shuts Down, Threatening U.S. Booster Production." Aviation Week & Space Technology. November 7, 1988, p. 29. Smith, Emily T. "A Safe Shortcut around the Toxic Road to Rayon." Business Week. February 11, 1991, p. 80. Templeton, Fleur. "From Log to Lingerie in a Few Easy Steps." Business Week. April 6, 1992, p. 95. "Turning Corn and Paper into Rayon." USA Today. June, 1991, p. 7. The lab cotton gin(TB510B) is divided into a lab roller gin and a lab saw gin. A large number of cotton is generally processed by saw gin in industry, and the cotton fiber processed by saw gin is shorter and less flexible than that processed by roller gin, but it has less impurity and looks shiny.